Whoops! Maybe you were looking for The Beatles? The Stones in their hip, young prime years, far from the old codgers they are now. The Rolling Stones (also known as Mick Jadestone and The Rolling Boulders) are an English dadrock band. Their lineup consists of Mick Jagger (lead vocals), Brian Jones Mick Taylor Ronnie Wood (guitar), Keith Richards (guitar), Bill Wyman Darryl Jones (bass), and Charlie Watts (drums). The Stones' legend goes something like this: on the 6th day, God created Man. But before that, on the 5th day, God created five Gods of Music. Eons later, they are STILL performing. They were known in the 1960s for their smoky pub rock sound, in the '70s for their funky soul-type sound, and from the '80s to now for...dinosaur rock. For those without comedic tastes, the so-called experts at Wikipedia have an article about The Rolling Stones. The Stones were formed and named by Brian Jones; Jones's identical twin, Davey, formed The Monkees around the same time. Brian, famed for his ability to play an instrument whilst taking drugs, led the band into stardom. Their 1965 hit "Satisfaction" was actually written by a known pathological liar named Tommy Flanagan, who originally titled the song "I Can't Get No Service In This Place". He and Mick Jagger were bar buddies. In 1965, Bob Dylan released the hit single "Like the Rolling Stones", satirizing their rise to fame. It chronicles their history through their early formative years as eukaryotic cells and follows them up through their meteoric rise to fame during the Great Flood, the Black Plague and both World Wars. During a tour in 1968, Keith Richards drank the blood of a possessed bat and that this is the true source of his unholy power. Since then, he has always slept upside down. The blood-incident is rumored to be the source of inspiration for their 1969 album Let It Bleed. In 1969, Jones was interrogated by the police for possession of a weed-flavoured Mars bar. To cover this up, he changed his name to Mick Taylor and a fake story about him drowning in his swimming pool was made. The band got the idea for the song "Brown Sugar" when Mick Taylor, being the prankster he is, swapped Keith Richards' cocaine for brown sugar. In 1972, the band took a trip to Disneyworld Paris. There, they rented a small shack and recorded the concept album Exile on Electrical Street. Telling the stories of beloved character such as Snow White, Dumbo, and Bambi, it became renowned as their greatest effort and they were crowned King of the Swingers by Walt Disney himself. 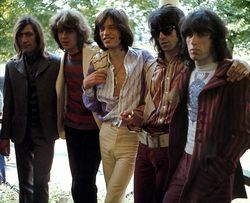 Later, the band relied mostly on Mick Taylor to compose their songs, as Jagger was too busy pursuing an acting career. By 1974, the stress became too much on him, and he left the band. In 1975, in an attempt to keep up with their younger contemporaries, The Stones recruited Ronnie Wood and embraced the art of disco dancing. Bill Wyman and Charlie Watts went along with it for a while, but by the '90s had become appalled with the schlock their band was putting out, and left. After declaring Bill and Charlie contractually dead to avoid having to pay him, Keith and Mick went into tax exile again. The band regularly cash in each year by touring and performing the same old hits over and over again. In 1998, Richards and Jagger formed the New York Dolls boy band, in attempt to compete with the likes of NSYNC and the Backstreet Boys. They released a total of two albums, which were spread out by ten years. In 2015, the band finally retired after releasing the album Where's My Hearing Aid? and holding a farewell tour. However, it is rumored that the Stones will come out of retirement, which was three hours ago, to make another album. In the year 3000, The Stones remain separated in there darkest hour in hopes of one day reuniting. The Rolling Stones is part of Uncyclopedia's series on Mass Media. This page was last edited on 16 November 2017, at 16:47.